Computer technology is the driving force behind commerce and many of the daily transactions we take for granted. As a result, computer scientists are vital to many aspects of modern life. They create and troubleshoot complex software and information architecture, and also develop applications that solve everyday problems. Whether you are coding applications for mobile devices or engineering a massive cloud computing infrastructure, earning your online master's degree in computer science will help support today's interconnected world. According to the U.S. Bureau of Labor Statistics (BLS), jobs in computer science are expected to grow by 11% between 2014 and 2024, which is faster than the national average. 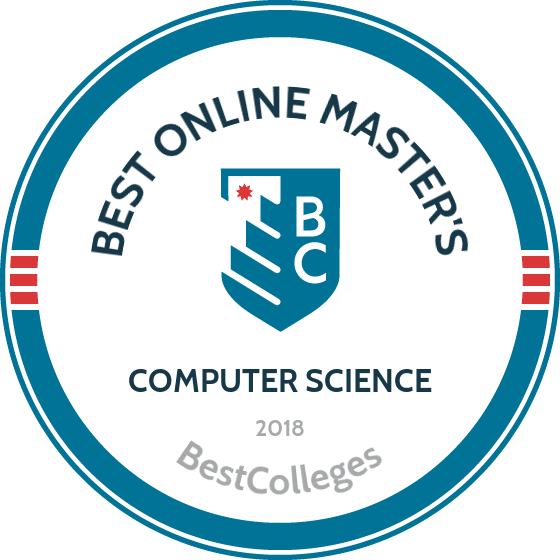 What Are The Best Online Master's in Computer Science Programs? Georgia Tech offers a master’s in computer science program that was created in partnership with AT&T along with integrated support from Udacity--an established online educational protocol. This online master's in computer science program includes over 25 courses on topics such as artificial intelligence, computational photography, and human-computer interaction. Georgia Tech also allows students to select one of four specializations: machine learning, interactive intelligence, computing systems, and computational perception and robotics. All students receive training in cybersecurity standards and have the option to enroll in elective courses on software analysis and testing. The school's integrated computer science department boasts an extensive alumni network that provides current students with several opportunities to obtain internships and job offers in the field. Georgia Tech is accredited by the Southern Association of Colleges and Schools Commission on Colleges. USC offers a master's of science in computer science program that emphasizes the best practices in designing, programming, and building computer systems. Distance learners have access to a high-quality research database and DEN@Viterbi, a unique blended course delivery model learning platform that allows for engagement with on-campus classes. The curriculum includes courses on a variety of topics, such as aerospace and defense systems, bioinformatics, and software design. USC has an extensive list of disciplines available for applied study in computer science, featuring concentrations in computer security, data science, software engineering, and machine systems. All online students pay the same tuition rate, regardless of residency. This online master's in computer science program consists of 28 courses and can be completed in two or three years, depending on a student's enrollment status and rate of progression. All students must maintain a minimum GPA of 3.0 throughout the program to graduate. NCSU offers a master’s of computer science program that was designed to serve working professionals and military personnel serving abroad. This 31-credit program does not require a thesis or comprehensive exam and courses are delivered using integrated video streams of lectures, class participation opportunities, and proctored exams. Students typically enroll in just one or two courses each semester and can graduate in just three years. The curriculum includes courses on a variety of computer science theory and systems topics, such as modeling, languages, numerical analysis, database management, computer networks, and software engineering. Applicants to this online master's in computer science program at NCSU must have completed all undergraduate course requirements with a minimum 3.0 GPA and submit GRE scores to be considered. NCSU is accredited by the Southern Association of Colleges and Schools Commission on Colleges. SIT offers an online master's in computer science with a highly customizable curriculum that is notable for its minimal core requirements, allowing for a freedom of specializations that is rare among other master's programs in computer science. Students can focus on developing skills that will be directly applicable to IT work in their current workplace or acquire new skills that may lead to future employment and research opportunities. This program has close ties with industry leaders like Microsoft, Google, and IBM. The 30-credit curriculum includes courses on a variety of topics, such as network administration, web application development, and architectural 3D-modeling. Concentrations are also available in select subsets of computer system design, including cloud computer networks, database design, and cybersecurity. Students must maintain a minimum GPA of 3.0 throughout the program to graduate. The online master's computer science program at SIT may be completed on either a part- or full-time basis. Illinois Tech offers a master’s of science in computer science program that prepares graduates for advanced study in a PhD program or for a career in research and development. The school offers specializations based on a student's chosen career path that can be used to customize their 32-credit degree. Distance learners can choose between a master’s thesis or project for their capstone session. There is no comprehensive exam option. Students with an undergraduate background in computer science can complete this program in just four semesters of full-time study. However, those without a background in computer science must complete prerequisite undergraduate coursework to enroll in major coursework. Computer science courses transferred from other colleges are accepted but may only be applied as electives. The curriculum for this online master's in computer science includes a comprehensive selection of coursework that is broken down into three core areas: programming, systems design, and theory. Illinois offers a master’s in computer science that is a non-thesis and non-research degree that is ideal for distance learners. Online students have access to the same lectures, assignments, projects, and exams as their on-campus counterparts. Illinois's computer science department boasts an impressive count of 60 faculty members. The 32-credit curriculum includes courses on a variety of topics, such as bioinformatics, artificial intelligence theory, systems and networking, and data architecture. This online master's computer science program must be finished within five years from admission, but generally takes students three years or less to complete. Students who have completed previous computer science coursework at another institution may apply up to 12 credits towards their degree. Applicants must have a bachelor's degree with a minimum 3.2 GPA to be considered. Illinois is accredited by the Higher Learning Commission. The online computer science master's at Minnesota is a coursework-only program that is ideal for working professionals who want to advance their careers. As a result, this program features less of an emphasis on research than one might expect from a graduate degree. This 31-credit program includes 16 credits of major coursework on topics such as modern cryptography, matrix theory, and animation and game planning. Minnesota delivers online courses through UNITE Distributed Learning Software, although there may be some required synchronous presentations or proctored exams. Applicants must have a bachelor's degree with a minimum 3.25 GPA to be considered and must maintain a minimum 3.0 GPA throughout the program to graduate. Students must complete the program within five years from admission. Minnesota is accredited by the Higher Learning Commission. NAU offers a master's in computer science online program that is divided into four detailed areas of study: internetworking technology, network administration, wireless technology, and cloud computing. This 30-credit program emphasizes in-demand technical skills that are needed to solve technological problems of modern companies, academic bodies, and governmental institutions. The program consists of 24 credits of core classes and six credits related to a student's desired specialization. NAU’s distance learning program is among the most cutting-edge, multidisciplinary, and collaborative systems available. All courses are delivered through Moodle and feature both synchronous and asynchronous instruction, depending on each course. Students can earn their degree in just two years of full-time study, although many tend to study for three years. Depending on an applicant’s undergraduate course history, additional mathematics prerequisites may be required for admission. NAU is accredited by the Higher Learning Commission. Purdue offers a top-tier master’s in computer science degree with an extensive selection of core and specialized courses for aspiring information technology professionals. All students are expected to learn basic programming languages, such as Java, C, or C++, before their first session. The curriculum includes courses on a variety of topics, such as bioinformatics, computational biology, databases and data mining, machine learning, software engineering, and programming languages. Students can also complete electives in cybersecurity, parallel and distributed computing, distributed systems, and geometric modeling. Purdue also offers a joint master's program with statistical analysis, which requires students to have taken advanced calculus and statistical methods courses. Classes are delivered through Blackboard and Purdue offers 24/7 IT support for all distance learners. While most applicants have an undergraduate degree in computer science, Purdue does consider applications from other fields. Purdue is accredited by the Higher Learning Commission. CSU offers a master’s of computer science program that was designed to help meet the talent demands of Colorado's modern software development industries. This program draws on the extensive research of its faculty to offer an in-depth curriculum that covers topics like networking and security, software engineering, artificial intelligence, and database systems. Graduates are commonly recruited by major computer leaders like Hewlett-Packard, Motorola, and Lockheed-Martin. The university’s Fort Collins network also provides professional-level training in the latest industry standards. This 35-credit program requires that students have a firm background in discrete mathematics, operating system design concepts, and object-oriented programming. The curriculum includes courses on a variety of topics, such as parallel programming, fine-grain parallelism, and object-oriented design. Classes are delivered in both asynchronous and synchronous formats, depending on the specific course. Students can enroll in this computer science master's online degree program on a full- or part-time basis. The University of Hawaii at Manoa offers a master’s program in computer science that allows students to easily customize their degree to prepare them for their long-term career goals. This program prepares students for a variety of careers in the computer science industry and can also serve as a foundation for doctoral study. The 31-credit curriculum includes courses on a variety of topics, such as operating systems theory, computer architecture, data security, human-computer interaction, and social informatics. All graduate students are required to submit a six-credit capstone requirement either as a thesis or as an independent project. Students must maintain a minimum 3.0 GPA throughout the program to graduate. The school desires applicants who have at least three semesters of programming experience and requires all students to fulfill a two-semester residency requirement. DePaul offers a master's of science in computer science program that feature some of the best resources available for training computer professionals. This program emphasizes a programmatic application of concepts to real problems faced in the industry. The 52-credit curriculum includes courses on a variety of subjects, such as medical imaging, algorithmic analysis, data mining, and scientific computer systems. Students must also complete either a thesis or research capstone project. Graduate internships are available at institutions such as the Federal Reserve Bank of Chicago, JP Morgan Chase, Microsoft, and Allstate. The computer science faculty at DePaul perform leading research in a wide variety of related fields, some of which have enjoyed funding from prestigious organizations such as the National Science Foundation. Applicants must have a bachelor's degree from a regionally-accredited institution with a minimum 2.5 GPA to be considered. Missouri S&T offers a graduate program in computer science that emphasizes critical topics in modern computer systems, emphasizing critical infrastructure protection and software engineering as primary areas of study. The 31-credit curriculum includes courses on a variety of topics, such as software testing, hardware/software co-design, and algorithm theory. There is also a capstone requirement that can be completed either as a thesis or research project, depending on a student's chosen specialization. Students must graduate within six years from admission. Since most students enroll in one to two classes per semester, the average degree completion time is about three years. Students also have the option to explore the university's graduate certificate program, which allows them to apply courses they've taken towards both a degree and certificate. Specializations for these certificates include: cyber security, software design and development, and wireless networks and mobile systems. NU offers a master’s of science in computer science degree program at National University in that provides students with the foundational knowledge and skills needed to work in database theory, software engineering, and cloud computing. The curriculum teaches students complex computer methodologies that are needed to solve real problems in the computer science industry. This program also includes communications programming that offers courses in the analysis of societal trends in technology and emphasizes the importance of effective communication with a non-technical audience. Students may select one of three areas of specialization after completing their core courses: advanced computing, software engineering, or database engineering. There is also a capstone requirement where students work directly with professional clients against real-time deadlines, allowing students to apply concepts and ideas learned in the classroom in a realistic simulation. NU is accredited by the Western Association of Schools and Colleges. NJIT offers a variety of programs that teach students techniques and concepts that are vital to the growing U.S. computer science industry. The school also offers its students research opportunities that allow them to work on projects that drive technological change and development in the industry. This 30-credit MS degree in computer science can be completed entirely online in two years of full-time study. Students may select one of three specialty tracks: databases and data mining, generalist studies, and networking. This allows students to customize their degree to meet their long-term career goals. NJIT also offers two graduate certificate programs, and these credits can be applied towards a computer science master's degree. All courses are delivered asynchronously online, allowing students to complete coursework at their own pace. NJIT is accredited by the Middle States Commission on Higher Education. Clarkson offers a MS in computer science program that explores the latest trends in programming languages, software system design, and hardware integration. This 30-credit program offers interdisciplinary courses on a wide variety of topics, such as electrical and computer engineering, computer graphics, software design and analysis, and operating systems. All students are paired with a research advisor in their first year and are required to orally defend a thesis to a panel of three faculty members at the end of the program. Research areas for this thesis are developed in conjunction with faculty. Some examples of past research areas include cybersecurity and cryptography, computer networking, and even virtual reality. Students without a solid background in computer science must fulfill basic foundational requirements before they can continue on to advanced coursework. Clarkson is accredited by the Middle States Association of Schools and Colleges. CityU offers one of the leading online master's degree in computer science programs in the country which boasts alumni in many senior positions within the field. Advanced coursework in compilers, cloud computing, and software engineering allow students to become fluent in multiple programming languages while also learning business skills to qualify them for future work opportunities. Students must choose one of the following concentrations: software testing, information security, and project management. The curriculum includes 39-59 credits of coursework on topics such as complex systems analysis and the ethical obligations of cybersecurity. All students are required to complete a capstone project with a focus in either applied computer systems or research. Students who don't have a computer science undergraduate degree or similar exposure to computer systems are required to enroll in prerequisite courses in addition to the normal curriculum. CityU is accredited by the Northwest Commission on Colleges and Universities. UWG offers a master’s of applied computer science program that is ideal for undergraduates who do not already possess a computer science background. The comprehensive programming at UWG includes courses in program construction, software development, database systems, and web technologies. All students are required to complete two project courses that emphasize a high degree of hands-on experience and professional training. This 36-credit program can be completed in as few as two years, depending on how many classes a student enrolls in each semester. The curriculum exposes students to the fundamentals of network management, security and integrity, and data manipulation languages. An introduction to object-oriented design is included in the degree path, with students required to develop an application according to industry standards. UWG is accredited by the Southern Association of Colleges and Schools Commission on Colleges. UI offers a master's of science computer science online program that includes the option of selecting either a thesis or non-thesis degree path. The non-thesis option includes an opportunity for an interdisciplinary project with the school's engineering department. This program emphasizes business methodology and advanced computer concepts. The curriculum includes courses on a variety of topics, such as in-depth analysis of compiler design, evolutionary computation, and fault-tolerant systems. UI's computer science department encourages innovative thinking and self-directed study. Students can seek guidance from faculty who have experience on research topics such as machine learning, computer architecture, bioinformatics, and software engineering. Applicants must have a bachelor's degree with a minimum GPA of 3.0 and display mastery of basic mathematical and computer science skills to be considered. UI is accredited by the Northwest Commission on Colleges and Universities. Lewis University offers a MS in computer science degree program that includes concentrations in cybersecurity, intelligent systems, and software engineering. This program fosters the type of creative and analytical thinking skills needed to pursue the most in-demand careers in the industry. This program teaches students how to design software, implement networks, and apply theoretical frameworks to relevant technological problems. Students complete coursework on advanced computer systems and capstone projects with external IT organizations to receive hands-on experience in the field. Applicants must have a bachelor's degree in computer science, computer engineering, electrical engineering, or a similar field with a minimum 3.0 GPA to be considered. Those without required computer science coursework may apply to take up to four courses to complete the missing areas of their foundational knowledge. Lewis University is accredited by the Higher Learning Commission. What Else Can I Expect From an Online Master's in Computer Science Program? The details and requirements of an online master's in computer science depend on the school and program. However, there are a few fundamental concepts and skills that nearly every program offers. In general, computer science master's degree students learn multiple programming languages for software and web-based applications. They may also learn to create and manage data structures, computer architecture, artificial intelligence, and operating systems. Introduction to Artificial Intelligence: This class introduces students to the skills they will need for careers as AI software developers and researchers, or for careers in data analysis and machine learning applications. The course covers the languages and algorithms needed for computer problem solving, logical reasoning, and machine learning. Database Management Systems: Like the name suggests, this course prepares students to become database managers who work either in-house or as outside consultants to develop, maintain, and troubleshoot databases. Students interested in this profession will learn the theory and implementation of concurrency control, recovery, and query processing. Computer Security: This course prepares students for careers as security architects, analysts, consultants, and other computer security-related positions. It introduces students to the core principles of authentication, identification, and security protocols, while also teaching them related security concepts including access control models, multilevel security, viruses, Trojan horses and worms, and cryptography. HOW LONG DOES IT TAKE TO GET AN ONLINE MASTER'S IN COMPUTER SCIENCE? Computer science master's online programs take about two years to complete and require students to take between 30 and 45 credits worth of classes. However, several factors affect the length of your master's program, including whether you choose to complete the program on a part- or full-time basis. Students on full-time schedules often complete the degree in about two years, while students on a part-time schedules complete the degree in three to five years. Other factors, such as whether the program offers individual-paced or cohort learning, can also affect the program length. In programs that offer asynchronous or self-paced learning, students start and complete learning targets and assignments at any time and create a schedule that meets their individual needs. In programs with synchronous or cohort learning, students begin the program at the same time as a group of peers and complete learning targets, classes, and other projects on a fixed schedule. If you're interested in an online computer science master's degree, be sure to choose an accredited program. Accredited university programs have undergone objective evaluation from outside professionals. Regional accreditation is considered the best indicator of school quality and usually applies to not-for-profit private or state schools. Schools with national accreditation are usually for-profit, career-based, or distance learning institutions. When choosing an online master's program in computer science, check for accreditation from agencies recognized by the U.S. Department of Education (ED) or the Council for Higher Education Accreditation (CHEA). In addition, it can be helpful to look for programs with specialized accreditation from an agency that focuses on computer science. Look for programs accredited by the Computing Accreditation Commission of ABET, which is a CHEA-recognized organization that accredits university programs in applied science, computing, and engineering. While the ED does not directly accredit institutions, it is a federal agency that oversees the accreditation system. CHEA is the organization that directly oversees regional and specialized accreditation agencies. If you would like to make sure that potential online programs are accredited, you can find a list of all accredited schools on the ED's website. This position involves developing applications and computer programs to accomplish specific tasks, or developing the systems that control devices and networks. Many software developers work for companies that specialize in computer systems design. This type of developer designs and creates websites and is responsible for the site's performance and usability, as well as its overall architecture and appearance. Web developers may also code specific content and customized pages for websites and should be experienced in both computer science and graphic design. These computer science professionals create data networks such as local area networks, wide area networks, and intranets in order to establish the connections necessary for communication and commerce. Employers sometimes prefer that network architects have a master's degree in a related field. Computer systems analysts work with businesses to help them run more efficiently. These professionals study computer systems and develop solutions to workplace technology challenges. They should be knowledgeable about both computer science and business, as this position often involves understanding how technology improves daily operations. Most jobs in this field require at least a master's degree in computer science. Computer and information research scientists invent and develop new computing technologies and discover new ways to work with existing technologies. Computer professionals who work in a research scientist capacity can find jobs in business, medicine, science, and many other industries. For most occupations, an online master's in computer science gives candidates a significant advantage and can lead to higher paying jobs. In addition, starting salaries for computer science professionals with master's degrees can be $10,000 to $20,000 more than the salaries of bachelor's degree-holders. Whether or not candidates have skills in project management and knowledge of in-demand programming languages also affects their level of pay. This organization has over 75,000 members in 100 countries and offers special interest groups for computer architecture, eCommerce, and other areas. ACM also offers student membership and benefits at a discounted rate. With over 100,000 members, IEEE is the world's largest organization for computer professionals. IEEE hosts conferences, offers tutorials, publishes journals, and features other services for its members. AWC supports women in the computer science fields through networking opportunities, career-oriented events, educational programs, technical and motivational seminars, and guest speakers. The organization also offers several local and student chapters. Many computer science graduate programs offer funding through teaching or research assistantships. In addition, both universities and outside organizations offer scholarships, grants, and fellowships to individuals pursuing their master's degrees in order to encourage solutions for complex computer science challenges. A few of the top organizations that offer scholarships include the National Science Foundation, the U.S. Department of Energy, and Facebook. For federal funding opportunities for your online master's in computer science, be sure to fill out a Federal Application for Financial Student Aid (FAFSA).